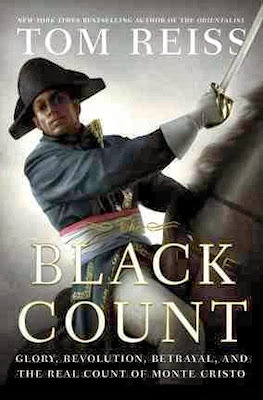 My dad and I read The Black Count by Tom Reiss. It’s a book about Alexandre Dumas, a black soldier in the French Revolution and the basis for the book The Count of Monte Cristo, a novel written by Alex Dumas Jr., the writer of The Three Musketeers. In the true story Dumas suffers from slavery in the military. At 6 foot 1 his immensely powerful muscles and intelligence make him a great soldier and he rises to the position of brigadier general and becomes the highest ranking mixed race man in the military of France. Then, on Napoleon’s mission to Egypt, Dumas longs to go to France. When Dumas leaves he is captured and held as a POW (prisoner of war) for many years by the kingdom of Naples. Then when finally released he expects to return to his honor and pride of democracy that always drove him when he had no hope. He returns to France to find it a disguised dictatorship ruled by his discriminatory rival, no other then Napoleon himself.